Surgical gloves must be comfortable for the convenience of the surgeon, as well as safe and sterile for the protection of the patient. 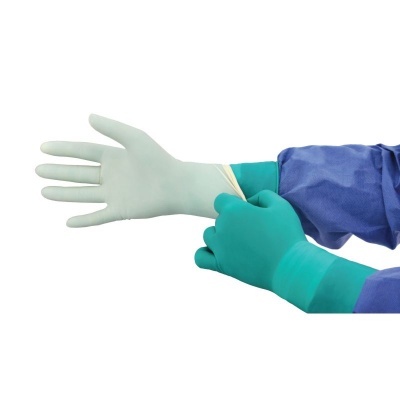 With a moisturing aloe vera gel coating on their inner suface, the Medline Signature Latex Green Powder-Free Surgical Gloves MSG55 provide fantastic comfort and are ideal for surgeons who suffer from dry hands. The Medline Signature MSG55 Powder-Free Gloves have achieved the EN 455 standard for single use medical gloves. This means they have passed testing for impermeability, correct sizing, strength and thickness, elasticity and biological safety qualities. The Signature Latex Green Gloves are designated Category III gloves, meaning they have a complex design which is intended to protect against the highest levels of risk. The world's first therapeutic medical glove technology, Aloetouch utilises 100% pure freeze-dried aloe vera gel located on the gloves' inner surface. This is clinically proven to moisture skin, as well as to assist with donning. The Signature Latex Green gloves are powder free and coated with a synthetic polymer to assist with damp hand donning. Their dark green colour allows for rapid detection of perforations into the outer glove. The Medline Signature Latex Green Powder-Free Surgical Gloves are available in eight different sizes, making them suitable for most users. Please measure the circumference of your hand around the knuckles (excluding the thumb) with your hand open and your fingers together, and the length of your hand from the tip of your middle finger to your wrist. Please note that the Medline Signature Latex Green Gloves are ultra-thin, disposable medical gloves that are designed for a close fit. They feature a fingertip thickness of 0.20mm.